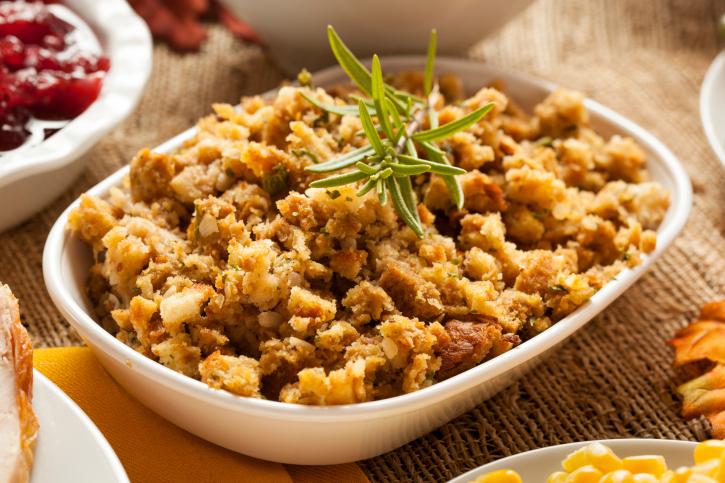 I love a lot of things about Thanksgiving, but my mom’s famous Thanksgiving Bagel Stuffing recipe is number one. It’s the one dish that is completely gone by the time dinner’s over. I love making it because you can prepare it up to four days ahead of time and it gives me one less thing to do come Thanksgiving Day. Make this recipe up to four days ahead of time. Step 1: Coat a medium-sized saute pan with olive oil and heat the oil over medium heat. Step 2: Once the oil has warmed, cook the onion, garlic, celery, and carrots over medium-high heat. Saute until the onions begin to brown (about 4 minutes). Step 3: Add a bit more olive oil and add the mushrooms and herbs. Cook until the mushrooms are browning (about 5 minutes). Step 4: Pour ¼ cup of the vegetable stock or broth into the pan and—using a wooden spoon or spatula—deglaze the pan (scrape any stuck bits of food off the bottom of the pan). Step 5: Place the cut bagels in a large mixing bowl and pour the mixture from the pan over them. Add the remaining ½ cup of broth/stock. Step 6: Season generously with salt and pepper, and let the dish sit for at least 2 hours, and heat before serving. This is a vegetarian recipe, but if none of your guests are vegetarians, you can add some turkey bits and turkey juices from roasting the turkey! For a gluten-free stuffing, use about eight slices of your favorite gluten-free bread; Food for Life's Gluten-Free Brown Rice Bread is a good choice.